Apparently indigenous on river banks and floodplains as far north as the Detroit, Huron, and Kalamazoo Rivers. Escaped to natural habitats as well as filled land, vacant lots, roadsides (seeding from planted trees), shores. Records mapped north of the southern three tiers of counties represent clear escapes, but a few of those farther south may also be based on escaped or even planted trees when label data with specimens are not clear. 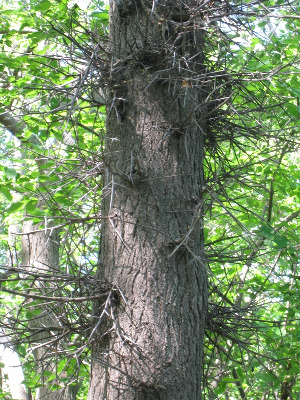 The stems are often armed with stout thorns, compound on older branches and trunk. This species, and Cercis canadensis, display cauliflory; inflorescences arising from the trunk and older branches, a feature typically associated with tropical trees. MICHIGAN FLORA ONLINE. A. A. Reznicek, E. G. Voss, & B. S. Walters. February 2011. University of Michigan. Web. 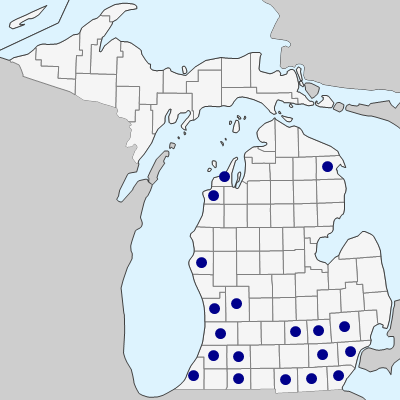 April 18, 2019. https://michiganflora.net/species.aspx?id=1302.